Once you venture beyond the basic black suit and black shoes pairing, the next classic style combination for men is pairing a blue suit with brown shoes. While it's a traditional look, it does require some styling to pull off correctly. Unlike with black which are always somber and subdue, blue suits often depend on the specific hue. 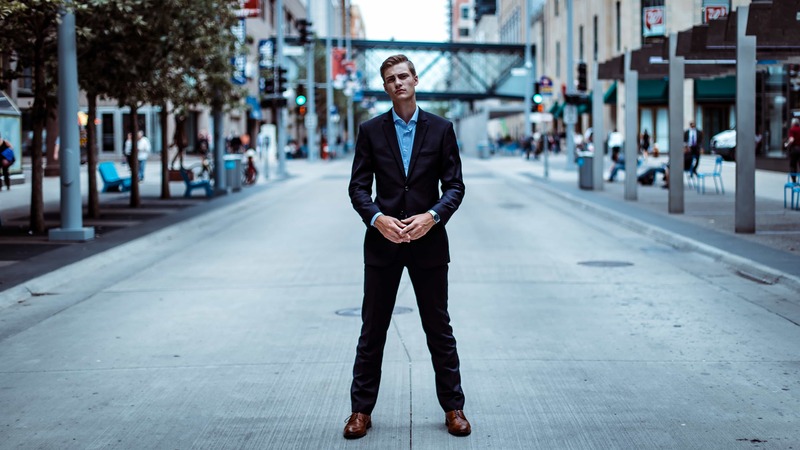 Navy blue suits look more modern and less drab than black or gray, giving you a bit more style while not compromising your professional appearance in the office. Or if you prefer royal blue, it's perfect for a more casual setting like a date or night out. When matching a blue suit with brown shoes, you project a confident yet understated vibe. The best part about this style, is how nuanced you can be — the colors lend themselves to be expressive, with a variety of tones and possibilities for accessorizing which can change the mood dramatically. Why the Blue Suit with Brown Shoes Trend? How Do Color Match Brown Shoes and a Blue Suit? When Is A Blue Suit and Brown Shoes Appropriate to Wear? First off, why does pairing a blue suit and brown suit even matter? With office wear gradually becoming more casual, many men are stuck in a precarious position between looking too stuffy and old-fashioned and, on the other extreme, looking too casual and unprofessional. Wearing a blue suit is a good bridge between traditional formal office-wear and modern casual, allowing you to look like an individual and express some personality without screaming "look at me!" While black dress shoes are a men's wear staple that every guy should have in his closet, however they don't always match well with blue pants. Much depends on the shade of blue — if the suit's color is too close to black, there's potential that they conflict, too bright a blue and black shoes won't match. In general, reserve your black dress shoes for formal, serious occasions and very conservative offices. That said, blue suits plus brown shoes can look great for weddings. That said, every blue suit and brown shoe will not naturally compliment each other. You will need to pair them based on the shade of brown and the hue of your suit. Generally it's best to get the suit first: find one that suits your skin tone and the occasion, then buy shoes that compliment the suit. The strength and weakness of blue suit is its versatility. There's a whole spectrum blue that can range from serious, for the office navy to just for fun egg-shell casual blue suits. Their tonality can vary and you can find a blue to compliment almost any skin tone, unlike black which leaves many men looking washed out. Before you go shopping for a blue suit, decide the tone you'd like to set. Is this for office or personal use? For work-wear, do have a conservative office where navy is the only option or can you go for slightly brighter, more modern hue like royal blue? If it's for personal use, is it for being a guest at a wedding or cocktail party where you want to impress without drawing attention to yourself? In that case, royal blue might be just the color for you. Or is it for a night out where you want to make a statement and stand out? Then look into powder or electric blues for your casual blue suit. If you're new to wearing blue suits, try starting with a neutral blue that you can dress up or down based on accessories and shoes. What color shoes go with a navy suit? The most conservative and traditional of the blue suits. Pinstripe navy suits can be a way to make navy more interesting without loosing much of the seriousness. A navy suit can be used almost interchangeably with black except for the most formal of occasions or offices. Pair with a dark brown Oxford shoe for a classic pairing that never goes out of style. What color shoes go with a blue suit? Most modern blue suits exist somewhere in the mid-spectrum of blues. Lighter than navy, darker than powder blue, less vibrant than royal blue. This blue is flattering to most skin types and lends warm and personality that a navy or black suit don't have. You can use your shoes to dress this suit up or down. What color shoes go with a royal blue suit? A rich, saturated royal or cobalt blue is a great pick for a night out or special occasions. The color is too flashy for most offices but perfect for evening wear. Depending on the tailoring, this can be paired with brown or black formal shoes. What color shoes go with a powder suit? Lighter blues are traditionally associated with summer wear and usually come in fabrics for hot weather such as seersucker, linen or chambray. They are less formal than a darker suit but a light blue suit and brown shoes can be perfect for a summer garden party or wedding. Now that you've decided to pair your blue suit with a brown dress shoe, which shoe do you need exactly? Again, the problem and joy of this combination is nuance. A black dress shoe will rarely shoe personal flair and fashion the way a brown shoe does. On the flip side, you can also go terribly wrong in picking out a brown shoe. First off, there's just a lot more variables when it comes to brown shoes. Color-wise, men's brown dress shoes range from light tan to a dark chocolate brown. Materials also matter more in brown shoes, you can go from a soft suede to a high polish to a beautifully aged patina. Also any styling or hardware such as buckles, straps or detailing will stand out more on brown than black. All this adds up. 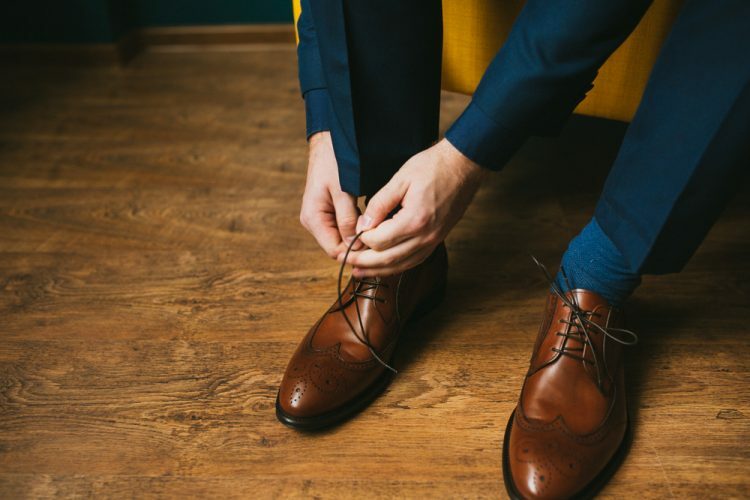 Whereas trying on different black dress shoes, the change to the overall look is minimal, you'll see that different brown shoes can make or break your look. Add accessories like a brown belt that matches the brown of the shoes to elevate the look. What color shoes go with a brown suit? While dark brown shoes may look almost black, but they will nonetheless give a slightly softer, more modern appearance. Medium brown shoes are less conservative but can still be dressed up for a modern office. They are the middle ground for the guy wanting personal style but still keeping professional. Light brown dress shoes tend to give a much more casual appearance and might not be appropriate at a more conservative office. That said, they also tend to develop a beautiful patina as they age and can make for a unique addition to your wardrobe. Tan shoes tend to be best used only for summer or casual situations. That said, they can be the perfect color to offset a light summer suit. Other popular browns include cognac which is a beautiful, warm brown similar to cognac, again this is generally a more casual color choice but can be the perfect one depending on your dress slacks. Burgundy is a reddish brown (again, like the wine it's named after). This can range from a fairly neutral color to a statement color. Pair carefully. There's security in going the traditional route. Formal brown shoes are a good substitute to black and fit a wide variety of situations by being so standard they blend in almost everywhere, from a meeting in the boardroom to drinks afterwards. Avoid rubber soles and aim for leather, especially leather that is sewn and can be resoled. These are shoes worth investing in and maintaining. With formal brown shoes, the styling is usually minimal with few accents and an emphasis on quality leather and classic shape. Pay attention to the toe — rounded toes tend to look more casual while boxy toes look more edgy. This is a shoe worth investing in —find a classic plain or cap toe that tapers along the shape of your foot for a style you can wear for years. Plain Oxfords & Balmorals: These are the classic shoe you probably think of when you imagine a man's dress shoe. While they have different names, the shoes are quite similar — arguably Balmorals are Oxfords without the seam. Oxfords & Balmorals with a Cap Toe: A common variation on the plain Oxford is a cap toe — a piece of leather sewn across the toe. While subtle, it does add an accent to a very basic shoe. Derbys & Bluchers: Another variation on the Oxford which are open laced, the quarters are sewn on top of the vamp and the laces are not joined but separate at the bottom. This can give a slightly more casual feeling to the shoe. Wholecuts: Like the name suggests, these are shoes cut from one piece of leather. If done well, they can be very elegant and a nice alternative to the standard Oxford. Pay extra attention to fit as wrinkles will be more noticeable on a whole cut. Casual occasions may call for a more relaxed shoe that shows some personality. Think a business lunch or night out — situations where you want your shoes to do more than blend into the background. A shoe with some detailing can add subtle style and lighter browns or tans automatically feel less formal and more casual. Tassels and broguing tends to be more casual. Add a touch of whimsy with playful or colorful socks. Brown Brogues: Somewhere between formal and casual are brogues. The shoes are technically Oxfords, Balmorals or Derbys but the difference is in the small perforated designs called brogues which decorate the shoe. In general the more brogues the more casual the shoe is seen. This ranges from Quarter Brogues in which only the toe cap seam has perforations, to Semi Brogues with toe cap seam and top designed all the way to longwing brogues with broguing going all the way to the back of the shoe. Brown Monk Straps: A modern twist on the traditional men's shoe. While there are one and two strap monk shoes, both are considered relatively informal. 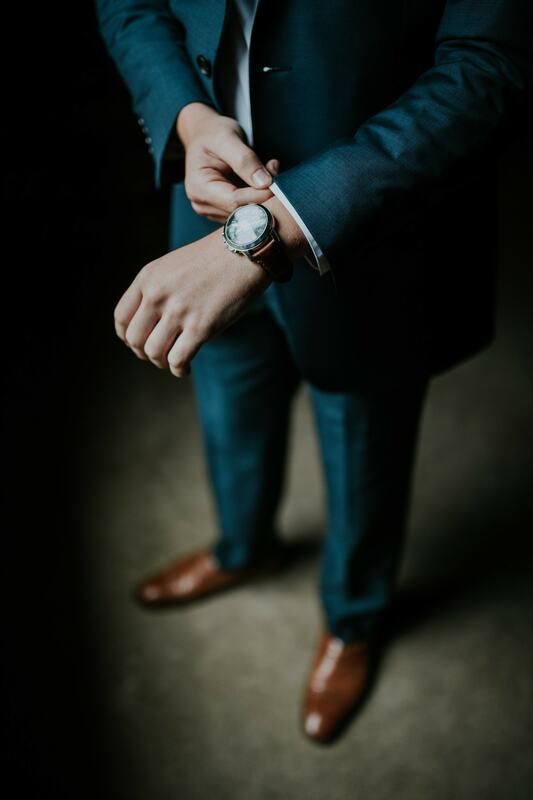 Since there are buckles rather than laces, keep in mind what other metal accessories you might be wearing (belt, watch, etc) and try to coordinate. Brown Loafers: These are slip on shoes that have neither laces nor buckles. While brown loafers can go with a suit, typically they fall in the casual camp. Loafers can range from Gucci Loafers to more casual tassel loafers. Brown Chelsea Boots: Another modern men's shoe is the chelsea boot, perfect for colder weather when you want to look stylish but also appreciate the extra coverage or just want a more edgy look. These are are a very flexible shoe that all guys should have in their wardrobe. What's great about the blue suit/brown shoes combo is it's appropriate for most occasions — you can wear it to work, a wedding, brunch, night out, date night. It's a very versatile outfit that looks polished but not like you're trying too hard. Where you might not want to wear a blue suit and brown shoes is a very formal event that requires a black suit. For traditional offices or formal evening occasions, it might not be appropriate. What Shoes Do I Wear with a Navy Suit? Navy is the most formal of the blues and can often replace black except for in the most formal of situations. Navy has a natural classical formality and evokes tradition and trustworthiness. If you already have a black suit, it's a solid next buy and is flattering to most skin tones. But what shoes match a navy suit? Combining navy blue slacks with brown shoes is a no brainer — black shoes and a navy suit can look jarring together, similar but not quite the same. Navy shoes with a navy suit is a bit too matchy (and who really wants navy shoes?). Brown shoes perfectly compliment a navy suit without looking overdone. Keep in mind, since the navy is formal, aim for a formal shoe type such as an Oxford and formal tone of brown such as a chestnut brown shoes. This should have you looking polished and ready for the office or an evening out. Can I Wear Black Shoes with a Blue Suit? Every man should have at least one pair of formal black shoes in his wardrobe. And if you've just bought a new blue suit, you might not want to immediately run out and purchase new shoes as well. Black shoes are ubiquitous and will match with almost anything. While they might not have the personality or flair of brown shoes, they often can pair well with a blue suit. As with pairing brown shoes, match the style of shoes with the style of suit. In general, black shoes will tend to give a more formal feeling so if you're trying to dress down a suit, it might not be a good fit. What color tie goes with brown shoes and a blue suit? What color belt goes with brown shoes and a blue suit? The rule of thumb in men's fashion is to match your shoes and belt. This also goes for the hue of your shoes and belt. A navy suit should pair with medium to dark brown shoes and belt. Meanwhile a light blue suit can match with tan shoes and a belt.